Here is the first of two lists showing the left over books that were offered at the 10-25 Chapter gathering at Quinnipiac. They were offered for $1 a piece. Attendees purchased almost 30 books. These are available for a donation to the Chapter Treasury. Email me at kcicitto@cox.net if you have interest. Superstars and Screwballs, 100 years Brooklyn BB. Goldstein. HC, W DJ. Men At Work. GF Will. HC w DJ. Clean. My Turn At Bat. Ted Williams with John Underwood. HC w/o DJ. Ex Libris. Season Ticket. R Angell. HC w DJ. Clean. Small tear on DJ. Faithful. Stephen King & Stewart O'Nan. Trade size SC. Former Library book. The Last Yankee. Turbulent Life of Billy Martin. HC w D j. Small tear on. DJ. Reggie, The Autobiography. R Jackson with M Lupica. HC w. DJ. Stated First. Low and Inside. Ira and H. Allen Smith. HC, no DJ. Ex Libris. Blockade Billy. Stephen King. Book on CD. On The Run. Maury Wills & Mike Celizic. HC w DJ,  former library book. Sports Illustrated Great BB Writing. Ed by Fleder. 557 pages, trade size SC. Day By Day In Dodgers History. Cliff Gewecke. Trade size SC. Clean. Your're Missin' A Great Game. W Herzog w  J Pitts. HC w DJ. Nice, clean. Zim. A BB Life. Zimmer & Madden. HC w/o DJ. Nice. 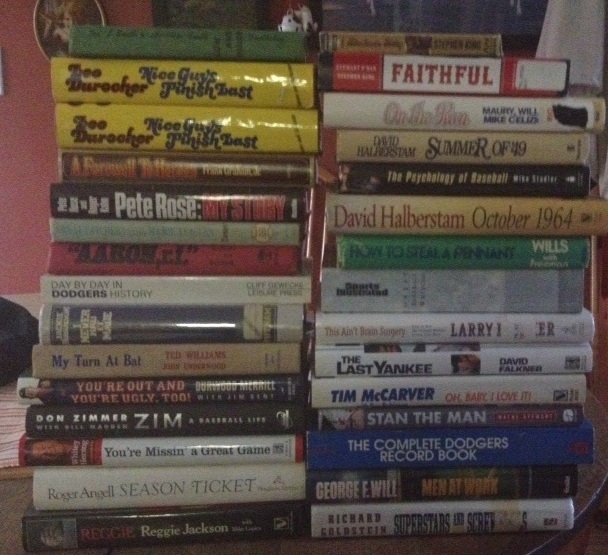 The Complete Dodgers Record Book. Gene Schoor. Large trade SC. Clean. Stan The Man. Wayne Stewart. HC w DJ. Clean, nice. Oh, Baby, I Love It. T.  McCarver. HC w DJ. Summer of '49. D Halberstam. HC w DJ. Clean. A Farewell to Heroes. Frank Graham, Jr.  HC w DJ. Clean. Great Catchers of the ML's. J Zanger. HC. Freehan illustrated front board has paper loss. Nice Guys Finish Last. Durocher w Ed. Linn. HC w DJ. Clean, nice. Ditto the above, similar condition, and ex Libris. Pete Rose: My Story. Pete w R Kahn. HC w DJ. Clean, nice. October 1964. D Halberstam. HC w DJ. Nice, clean. Small tear DJ.